Recently, I was reading an article about the life and death of the presiding patriarch in the LDS church Eldred G. Smith. He was quite an amazing individual and during his life it’s believed that he performed over 20,000 blessings for individuals. Quite an amazing thing. I’m sure that all 20,000 blessings were unique and specifically for the individual receiving it. When I was a teenager roughly around the age of fifteen I prepared for my Patriarchal Blessing (Evangelist Blessing) in the LDS denomination. I had only met my Patriarch maybe twice. He was not a member of my particular ward (congregation). The blessing he gave me too this day still holds meaning. I often pull out the hard copy and read it from time to time. Occasionally, I read things that were not evident to me 10 years ago or even a year ago. This man who I barely knew shared with me things that only God himself knew. The blessing stands as one of the most significant events of my life. About eight months ago I pulled out my patriarchal blessing and began reading it. Some of the promises that were given to me at age fifteen seems to have come to past, however, there were other aspects of it that did not seem to hold the same meaning as they once did. Andrew at the age of fifteen was a very different person than Andrew of twenty-seven years of age. Over the last twelve years I had been married, had two beautiful children, graduated from college, and at this time of reflection I was going through one of the most significant events of my life. My relationship with Christ was changing and I was about to join another faith. I was discussing with my friend of how the blessing of my youth seemed to be a little dated and seemed to speak to a different person.My friend told me “why don’t you get it re-done?” This was something that I was a little skeptical of doing at first. Though I felt my blessing was for a young teenage boy; it still held promises that are dear to me and I believe they’re promises to be fulfilled later in life. My friend explained to me that the Evangelist Blessing would not be replacing my Patriarchal Blessing it would just be another opportunity to hear what message God has for me. I decided I was to accept this invitation and prepare for my Evangelist Blessing. I met my Evangelist for the first time in a loud and noisy Chinese restaurant. It was extremely informal and it was nothing like my first meeting with the LDS Patriarch of my youth. Roger told me of his life and his experiences and I shared with him mine. I really didn’t know Roger. Roger is part of my congregation, but prior to our meeting I had only known Roger through his sermons. I was a little apprehensive about this meeting. My fear was that my understanding of the blessing was different than his. Roger had grown up in the Community of Christ where I had my experiences in the LDS church, but during our meeting I realized we had a lot in common. Our theologies were similar and our stories were similar. Meeting after meeting I began to trust Roger and not only did I see him as this man who was going to be used as a tool of God. I saw Roger as my friend. Despite all this positive feeling; I was having a hard time of letting the spirit work with me. I really was fixated on how this was going to work in relation to my Patriarchal blessing. I also was fixated on what message might Roger share with me. I thought about what I wanted to hear. I stumbled across a video made by Bryce Veazey entitled “Journey of a Blessing” the video touched upon many of the same things I was struggling with in my preparation. I was struggling with what I wanted the blessing to reveal to me instead of clearing my mind, so that God can reveal to me what I needed revealed. I decided to do as Bryce did clear my mind and await to hear the message that was intended for me. At the end of my blessing I felt an overwhelming sense of peace come over me. I was joyful and I knew that God loved me. I had just received a sacrament that came from God. It is unique and in my case it meshes very well with my previous Patriarchal Blessing. Roger was someone who I barely knew prior to the blessing, but during the experience he shared with me a sacrament that will stay with me for the rest of my life and through the power of God he knew me better than I knew myself. 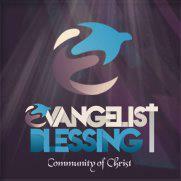 If you have never received an Evangelist Blessing I encourage you to do so. You do not have to be a member of Community of Christ (I was not a confirmed member at the time). If you have received one in the past and it doesn’t quite speak to you in the same way that it used too consider getting another one. If the one you received means everything to you and you have no need to get a new one or an update. I encourage you to read it often. This sacrament is such a blessing that those of us in the Latter Day Saint tradition are able to partake of. Please feel free to write about your experiences below or share any thoughts that come to mind. This entry was posted in beliefs, Community of Christ, doctrine, LDS, Mormonism. I’m LDS. Just out of curiosity, what drove you to become part of the CofC? I see so much good in both churches, but lacking also. I love the LDS endowment and temple sealings. I very much enjoyed doing baptisms for the dead, and I like Joseph’s Nauvoo theology, which I do not view as a contradiction or repeal of his Kirtland teachings. I love knowing that if I’m ever sick, or if my wife has a baby, the members of the Relief Society will be at my door with a prepared meal. My home teachers would help my family out with anything. My wife loves the friendships and community she has in the Relief Society. I love the guys in my Elders Quorum. My family loves our ward and we love our traditions history. Being Mormon is more than a religion, its an ethnicity. At the same time, I have holy envy for the CofC. I like the public weddings. I love the open cannon. I like the focus on the spiritual meaning of things rather than the historicity. I like that there is a Standing High Council. I like that the World Conference is the highest governing body of the Church. I love the focus on building up Zionic communities and the egalitarianism of 1830s Mormonism. Both traditions have good arguments for the succession crisis of 1844. So please, if you’re comfortable, please share with me why CofC is your preferred home in the Restoration.